They almost don’t come any more hallowed than this recording. Frightfully well recorded, this tape does as much to show how good AUDs could be, even back in 1971, as it does to show how unfortunate it was that most others from the really early years were not. With this recording, Harvey Kaslow and Craig Todd raised the bar for the entire span of Grateful Dead audience recordings. While the actual master reels themselves still elude us to this day, Rob Bertrando’s reel copy of the master seeds all variations of this show in digital (and non-digital) circulation. 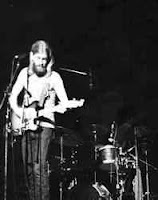 More so even than recording the Dead on this night, Kaslow and Todd also captured the New Riders of the Purple Sage (still with Jerry on steel) opening set, thus providing us a heaven-sent window into an entire evening with the Grateful Dead family. Since we have it all at our fingertips, I implore you to listen to this date from the true begining. Start with the Riders set. You will not be disappointed. With this AUD’s ability to present near crystal clear clarity and great stereo separation, it provides one of the most potent ways to immerse yourself into a night with the Grateful Dead in 1971. To be sure, virtually every one of those nights in ‘71 included the New Riders of the Purple Sage. Here’s the thing about the NRPS. They were able to distil psychedelia into a concentrated syrup and drop it expertly into standard song structure such that it would infuse everything. It’s more subtle than anything that might grab you by the shirt and fling you into a wormhole like a Dark Star, Other One, or intense feedback. Also, you’re most likely to find it only by not looking for it at all. It’s more sneaky than that. You go in looking to enjoy some fine country rockin’, and come away having found far more being provided. Jerry poured an incredible amount of psychedelic energy into his steel playing. It was clearly a joyous outlet for him when the Dead began “going country” in 1969, allowing him to express himself through a different voice. But he was still Jerry Garcia. 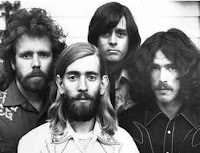 And it was still 1969, ’70, and ‘71 Beyond their being a talented group of musicians supported by terrific song writing and expert covers, they could gently stretch the more formal borders of country western music into something all their own. Having Jerry in the band as a side man playing steel and singing back up was ideal for all parties. Make no mistake, by the way, it was not Jerry’s band. It belonged to David Nelson and John Dawson. On 08/06/71 the Riders were in perfect form. The ease you feel from the band is luscious. They take the first couple of songs to completely settle in. The vocal mic required a little adjustment before things balanced out completely. When they reach the third tune, "I Don’t Know You," they are off to the races. The sound system kinks are worked out, and the song sparkles into the room and typifies the perfect blend of country and light psychedelics that was the Riders pure comfort spot. Marmaduke’s (John Dawson) lyrics, distinct vocal inflections, and the groups spot on harmonies are icing on the cake. After the song, there’s a great conversation in the audience near the tapers where a gal clues in that it is actually Garcia playing the pedal steel. She tips off her neighbors, and even has to explain to one that Garcia is the lead singer of the Grateful Dead. Priceless stuff. Earlier in the set there’s also an enjoyable little conversation between some guy and the tapers themselves talking about the recording set up. It’s during the next song, "Down In The Boondocks," where Garcia begins to really shine. Easily my favorite of all of his Boondocks solos (yes, I've also obsessively collected all the NRPS shows in circulation), it’s at this point that you get the sense that he might be headed toward an inspired night of music. Next comes Portland Woman, one of the band’s most infectious tunes. More sensational solo and fill work from Jerry, and the band has managed to slip into much more of their psychedelic rock vein - you hardly saw it coming. Then comes Dirty Business. Jerry flips on the fuzz box and the wha-wha pedal, and things become decidedly more weird. This song snakes its story out into the crowd. And between the verses, Jerry reaches some undeniably mind melting moments over and over again. You’ll find him shaking the Palladium to its foundation as his solos progress. There is more condensed, raw power flying off the stage during these sections than can be imagined. Electricity crackles in the air. 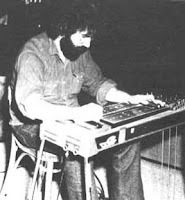 You sense that the pedal steel is resonating itself to the point of levitating off the stage. It’s pure amazing Jerry Garcia; one for the record books. And it isn’t coming from the Grateful Dead. Perfectly, the band rounds the corner out of the brooding, coal dusted vibe of Dirty Business into Henry, and the hall is elevated right back into the band’s bright sunshine, carefree, weekend energy. This pervades the rest of the set, and you can’t help but feel good as they move from song to song, everything dappled with Dawson’s great vocals, Garcia’s brilliant side man work, Nelson’s string bending twang, and sweet harmonies from everyone throughout. In much the same way that the band managed to bring on its psychedelic edge quietly through infusing its power into the nooks and crannies of their music, the highlights throughout much of this set appear more in the way a little salt flavors the entire dish you add it to in cooking. The band’s skill is everywhere, bubbling up in all aspects of the music, drawing you along. 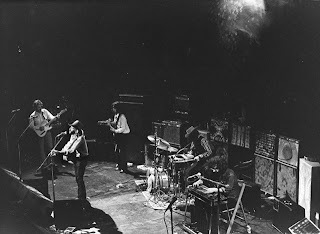 While we experienced evidence earlier that some fans had no clue who this NRPS band was, clearly there are a few fans in attendance who are well seasoned listeners, demonstrated when someone screams out a request for Only Daddy That’ll Walk The Line, a song not often performed by the band. They immediately grant the request and deliver a great version. When we get to their cover of The Weight (a mainstay for the Riders) the entire theater has become completely enamored with the band, clearly no throw away opening act here. More wonderfully delivered lines from Dawson. More stellar solo work from Garcia. And still the set goes on to deliver gem after gem including the haunting Last Lonely Eagle, and mammoth set closing rocker of Honky Tonk Women. The crowd is left on the tips of their toes, and the Dead show has yet to begin. Set one is great, and sounds so good. That unmistakable AUD energy is everywhere. While 1971 typically stands in the shadows of the years immediately on either side of it, the year resonated with its own distinct characteristics, none-the-less. And this recording captures exactly what 1971 was about beautifully. The crowning jewel of the first set is the tremendous Hard To Handle. A featured track on Fallout From The Phil Zone, this Hard To Handle has long been considered the best of all time. 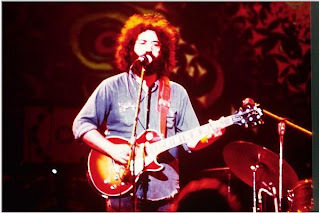 The band’s ability to fan the flames of energy throughout the solo section of this particular rendition, and its subsequent transmission of energy into the audience, combine to capture on tape the most elemental power of the Grateful Dead – that invisible connection between band and crowd, building into each other until they act as one. It’s nothing short of invigorating to be along for this ride as the crowd’s frenzy coils and boils into a frothing sea of electricity. Caught in stellar sound quality proves that once in a while everything is in the right place at the right time. Splashing perfectly into Casey Jones, the entire crowd locks in and sings along. Even the perpetual "Woo-Woo" guy seems forgivable in light of how beautifully this tape brings across the experience of the band/crowd energy. A sensational end to the first set. Set two opens with stand alone Saint Stephen. Gutsy with swagger and bounce, the song ends up somewhat disjointed by a few slight miscues and Jerry breaking a string in the final solo. They end up having no trouble what-so-ever making up for the rough start as the go right into a powerful 1971 Truckin’. Jerry’s guitar work in between Bobby’s vocals is acrobatic – lots of really nice stuff going on. On the tail of a clear Other One premonition, they head into a quick drum break. Then comes a classic 1971 Other One with Jerry’s leads casting a dark magic conjured from ancient spells. The song is all about stoking its own dark voodoo for the first handful of minutes before it whisks away the horizon and exposes you to a groundless perch among stars and moons shrouded in fire and red smoke. The brink of danger is everywhere. Then, with full embodiment of the sinister nature of the song’s main character, the band slowly begins to reveal Me And My Uncle. Glimmer by glimmer the song transition appears. You can feel the musical hints coming on, which eventually reach Billy’s ears. Yet, as he calls up the backbeat, the rest of the band remains in the darker gloom of the Other One’s foreboding and thick canopy and for a brief time you are wonderfully caught completely between songs. Soon Me And My Uncle fully materializes and has all the connective tissue needed to justify its placement in the middle of an otherwise psychedelic romp. It feels just right, having somehow wafted in on an unsuspecting breeze. It’s dead stop transition back into the swampy night of the Other One leads to a gentle, yet still dark passage that includes Bobby tossing in a few measures of his Weather Report Suite Prelude, years before it would fully mature. Jerry is casting stars from his finger tips, and everyone is floating along the eons-slow spin of galaxies. Eventually Other One returns, and the witchcraft takes hold again. The song reaches some wonderful heights (again) and then lands squarely back into the final verse. Later, a majestic Morning Dew casts its always timeless power over the crowd. As is typically the case, you could line up Morning Dews from all the years and find little distinction between them beyond the quality of Jerry’s voice. The song is pure Psychedelic Americana Folklore Rock. Seeming incapable of coming across as anything short of soul piercing, as the song heads into its most quiet moments on the way to its slow elevation of sound and energy, the air is filled with drifting sunbeams pooling into stained glass oceans. Jerry sings softly, the music swells and throbs – another moment where you can find no reason to ever leave. Closing with Lovelight, Pigpen delivers another great rap which includes his stopping the band completely so he can have a frank heart to heart with all the fellas in the crowd. Once stopped, the band oozes back into form around him out of volume swells and shifting feedback which eventually coalesce into a sweaty delta bluesy groove which slowly builds in tempo. Jerry kicks out some super blues soaked riffs as they head toward the final section of the song. A not too offensive tape flip forces the song to reach its climax a bit sooner than we might like. But it’s still a 23 plus minute version, and while not one for the ages, still a very good time. Personally, while I’ve visit the NRPS set from this night time and time again, I had not listened to the Dead show end to end in nearly 10 years before getting ready for this review. In such nice quality - what an awesome gift. You’ll want to frame this entire night and mount it on a wall. Remember, Riders first. WOW. What an amazing show, and so expertly captured... I'm so grateful to the taper I really can't express it in words. And thank you icepetal, for bringing it to my attention. This show has the ultimate demonstration of how an AUD can be so much better than a SBD. With the release of "Road Trips Volume One, Number 3" we've got side by side comparisons of the fantastic Hard to Handle in both formats. I had high hopes for the SBD, and it's fine, no complaints. But it's not mind-blowing like the AUD. Jerry's solo is back in the mix, more like decoration that you have to remind yourself to listen for, instead of front and center with all spotlights blazing which is how the AUD presents it. And the audience is so swept up in the amazing grooves that it's almost another instrument in the band. It's a night when Garcia the Guitar Hero shows up; the audience feels lucky to be hearing it and they make their excitement obvious. The combination of mix and audience reaction shows off a positive feedback loop that's a thrill every time I hear it. That feeling of unstoppable momentum and a climax that seems to go on and on. So the AUD is really a very different listening experience. I'm so happy this blog exists. This is exactly the stuff you want to know about! Do you know if there's something comparable for Phish? (Good music writing about the performances and recordings (rather than festival stories and lists of whatever was trivially different between shows (Trey forgot a lyric from Cavern or flubbed the guitar melody from Lizards--whatever--we need to know where the *jams* are (but it is good to be surprised, too, & to find one's way in by accident). My blog, which I just started, is a personal map of shows/songs/jams (like, I need to tell you where these moments are in case anything happens to me) but so far it's self-indulgent and digressive... maybe I should start by getting a cool screen name like you guys! anyone who feels that the lovelight is not SPECIAL is wrong -memories of listening to it 30+ years ago as an early 'taper' and my memories survive the timespan -- the uniquesnees of it is evident by the slide playing,ryt=hmn riff as well as 'feedback' teases and more -- although we are told it was lost for many years it certainly circulated albiet briefly in the early '70's and has sttod the test of time as I mentioned -- I have yet to hear one remotrely similar -- also the setlist is special for a '71 show - has the feel of a 68/69 -- morning dew,other one, lovelight and much more in '71? -- more than rare -- it happened and we have it to ENJOY -- then and now !! This was my 17th birthday party! My friends and I had a great time and one even garnered his long standing nickname at the show. I think we went to the beach in Santa Monica afterward. Great taping job here. NIce to have the NRPS stuff. Thanks a million! I've only recently gotten on the bus, but I agree that this is a terrific show, and a great audience recording to boot. Thanks for taking the trouble with the blog, it's been an invaluable resource in my journey thus far. This was the first show I ever downloaded, albeit completely at random, and I have never found a show that I enjoyed listening to as much as this one. Cornell doesn't even compare in my opinion. The raw energy exhibited in this show is truly a rare thing to see, even for a grateful dead performance. You can actually hear Weir tell the taper that he needs to back up about 40 feet if he wants a decent recording (right after they finish Bertha) but obviously he knew he had a sweet spot and we can all be grateful he didn't take the advice. Taper lore also says that at the climax of the Too Hard To Handle solo Jerry fell to his knees. Morning Dew changed my life. Every song in this show is amazing great energy from the band I always find myself dancing to Playin' in the Band. Id say Cornell is on the same level I listen to them interchangibly and recieve the same enjoyment from both. Well, I have a good story. I am from Orange County and I was in awe of Jerry Garcia. I was one of those guys who played in garage bands and it was Garcia that taught me scales, chord progressions and how they all fit together. For a 15-17 year old, I think I was a little ahead of my time, because I was into it for the music only. Getting high helped, but the music was more important to me, and the Dead were the pinnacle of music. On my 16th birthday, I had seen the dead in '70 at the Santa Monica Civic, which was very interesting also. But, I had to go see NRPS and the Dead at the Palladium. The Palladium was a weird place because Lawrence Welk performed there and I seem to remember painted champagne bubbles on the wall and the rotating mirror ball on the ceiling. But regardless, all the folks were excited. In high school, I only had one girl who made it known that I was her man of choice-- which was pretty exciting in the early 70's. So my idea of a great date was to go see the Dead and NRPS. 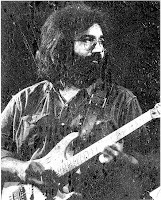 We got to the Palladium 45-60 minutes early and Jerry Garcia was already on stage tuning the steel, laughing, practicing and having a good time. I froze and just stared at him for until they started playing. It is one of the most vivid memories of my teens. The NRPS black-and-white photo above is exactly what is etched into my memory. I just figured my "girlfriend" was just as awestruck as I was. So, when NRPS fired up and started playing, the Palladium filled with smoke. My Orange County girlfriend lasted about 5 minutes and told me she needed to use the restroom. I figured, "OK, my girlfriend need to use the restroom." It was a long concert. First, NRPS then the Dead. Garcia played the whole time. He probably played over 4 hours doing everything that I had come to expect of him. He was first on steel then on lead guitar and I watched his hands the whole time. After about 3 hours I noticed that my girlfriend was still in the bathroom. I thought "she is really missing a good show by going to the bathroom for so long." So, it was a great-great show. When it was over, my OC girlfriend showed back up and demanded to know why I did not come looking for her. I told her that I did not know that I was supposed to go looking for her. She said there were so many freaks at the show that "she had to lock herself in a bathroom stall to avoid being felt up by some hippie". I told her that men, especially teenage men, were not allowed in women's bathrooms. I was not too high, but the drive home was completely silent. SO, that was my last date with my Orange-County blonde honey. If wasn't for Garcia, NRPS and the Dead, maybe we would have had kids and I would be locked into the never-ending quest for money that consumes every second of life in southern California. So there is still a legacy. I am up in NorCal behind the Redwood Curtain instead of that concrete mind-state called LA/Orange county. I sort of dropped guitar but I play pedal-steel guitar. However, one of my Fender Strats is a wood-tone finish just like Jerry had. Jerry played a Zane Beck the precursor to my Beck Musical Instrument steel. My pedal steel is black and I am trying to buy another one too. The next steel and any others that follow will always be black too. I am not the hoo-hoo guy. I heard this tape and it is a great one. I wonder what my sweet girlfriend remembers that night. thanks for sharing such an awesome story,.